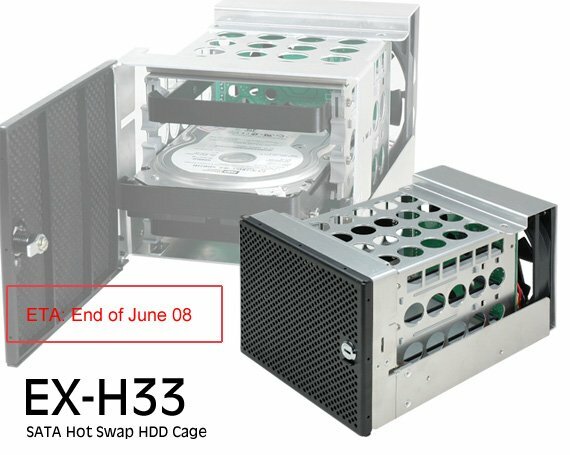 Lian Li released its EX-H33 HDD rack - this product is made out of aluminum and takes up three 5.25" drive bays. The EX-H33 offers enough room for three 3.5" HDDs, has a silent 120mm fan and a dust filter. The HDD rack has a front loading door, with individual handles on a bracket for each HDD, as well as a back panel PCB designed to accept most modern SATA HDD configurations in a Hot Swap Plug & Play configuration. To keep the device cool there is a 120mm fan (1000RPM) with a washable nylon filter keeping dust and debris out. The HDD rack takes up the equivalent of 3x 5.25 bays, and can be installed into the front 5.25” panels of most modern chassis. This is ideal for those cases with rows of 5.25” bays, but with very little HDD space. The cage is lockable and complements Lian Li style with the hair-line brushed anodized aluminium in a black finish, combined with finely filed edges, and hand crafted tooling to prevent jagged edges, lending both safety and elegance to this neat HDD cluster rack. Mounting HDD’s is very convenient, with each handle mounted using screws, which act as guiding wheels as the hot swap HDD device is inserted onto the back panel securely. It supports RAID configurations according to your motherboard specifications.